[Following the outrageous annexation of Crimea by Putin’s Russia], the U.S. imposed sanctions on three Russian individuals — Vladimir Yakunin, Yelena Mizulina and Aleksey Pushkov — who have cooperated with WCF, among others. Since the WCF is, above all, a U.S.-based organization, they most likely decided not to risk harming its reputation domestically by dealing with the sanctioned individuals. One organisation that had planned to take part in WCF VIII in Moscow, Concerned Women for America, pulled out for a similar reason. As its president Penny Nance said, "We made the decision that we’re not going to Russia. I don’t want to appear to be giving aid and comfort to Vladimir Putin". As it often happens with the "good Christians" from various hate groups, the cancellation story was a lie. 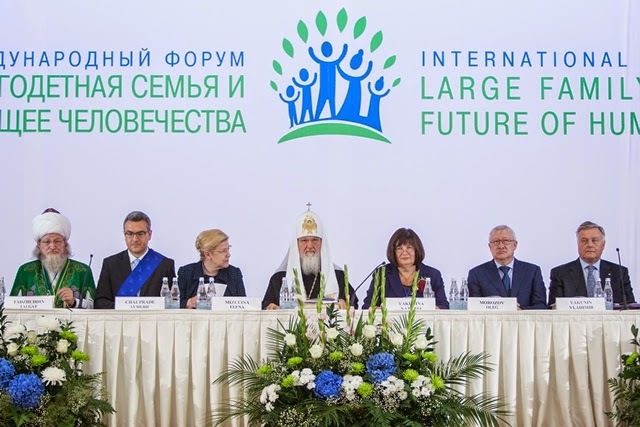 The WCF VIII did take place in Moscow on 10-11 September 2014, but had a different - yet unsurprisingly similar - name: the International Forum "Large Family and Future of Humanity". WCF held a leadership strategy meeting for representatives of pro-family groups attending the event. 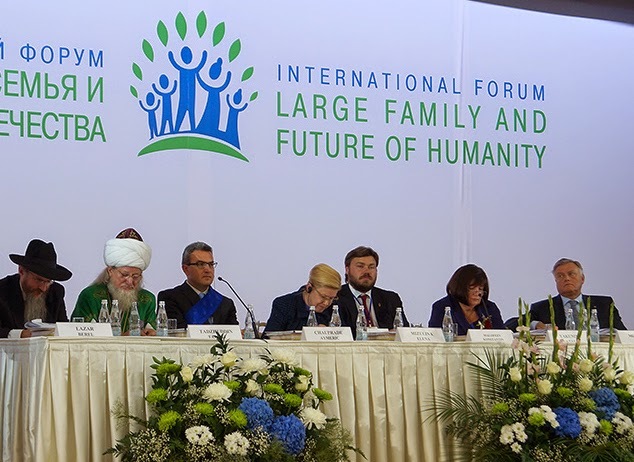 There were reports on the upcoming International Forum: Large Family and Future of Humanity (Moscow, September 10-12, 2014) and World Congress of Families IX, Salt Lake City, October 27-30, 2015. 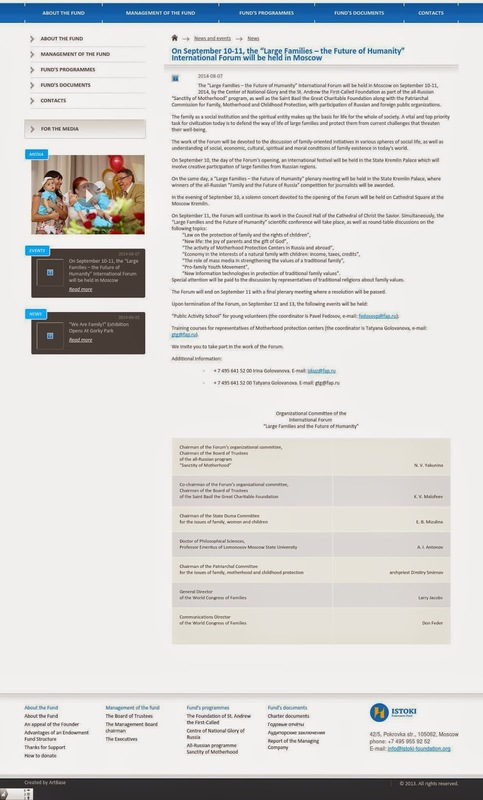 Note that the meeting in Salt Lake City in 2015 will be called WCF IX, not WCF VIII (it would have been natural, since WCF VIII was allegedly cancelled), so this is yet another confirmation that the International Forum "Large Family and Future of Humanity" is in fact the planned WCF VIII "Every Child A Gift: Large Families – The Future of Humanity". 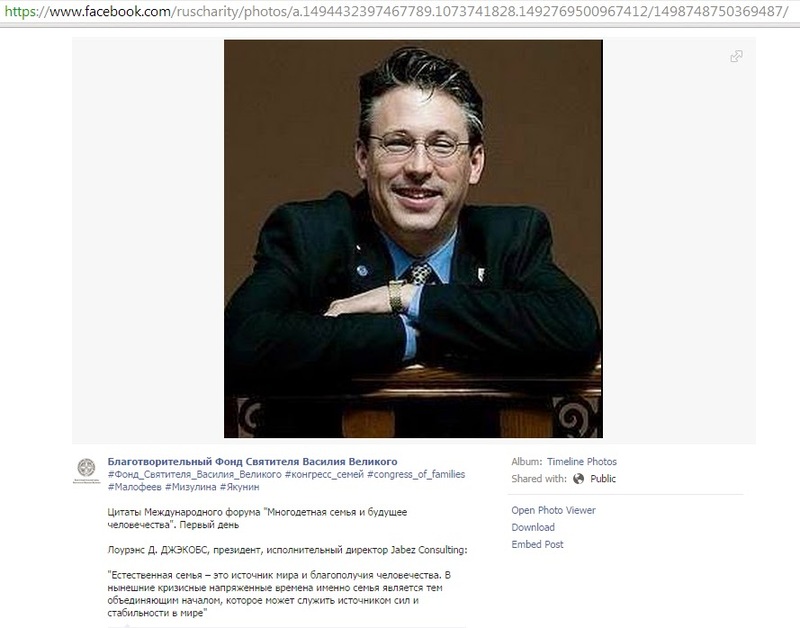 Yet the leadership of the WCF and other organisers of the meeting strove so much to obscure the WCF's involvement that even the WCF's General Director Larry Jacobs was presented on the Facebook page of Konstantin Malofeev's St. Basil the Great Charitable Foundation not as the head of the WCF but as "President, CEO of Jabez Consulting". (Click to enlarge) The St. Basil the Great Charitable Foundation quotes Lawrence Jacobs as "President, CEO of Jabez Consulting". Note the hash-tags, however. 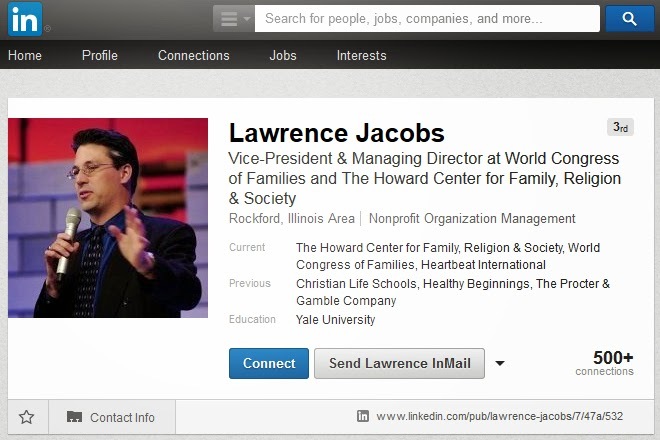 Jacobs is indeed the founder of the Jabez Consulting, but he does not even bother to mention this fact in his main profile on LinkedIn where he describes himself primarily with a clear relation to the WCF. In other words, the organisers of the WCF meeting in Moscow have done much to confuse casual observers, but too little - to deceive others. The US authorities may have questions to the WCF concerning their contribution to the uncivil society in Russia and cooperation with sanctioned individuals (see below). Apart from the WCF, the meeting was co-organised by the Russian Orthodox Church, Vladimir Yakunin's Centre of National Glory and the St. Andrew the First-Called Foundation, and Konstantin Malofeev's Saint Basil the Great Charitable Foundation. Both Yakunin (sanctioned by the US) and Malofeev (sanctioned by the EU) are Russian oligarchs. Moreover, Yakunin is one of the most important representatives of the siloviki group that now seems to control the Kremlin, while Malofeev is an important connection to the EU-based far right parties and has been deeply involved in unleashing the "Ukraine crisis". As Austrian journalist Bernhard Odehnal reported, Malofeev recently convened in Vienna a secret meeting of Russian and European fascists and right-wing politicians such as Aleksandr Dugin (International Eurasian Movement, Russia), Marion Maréchal-Le Pen and Aymeric Chauprade (National Front, France), Heinz-Christian Strache and Johann Gudenus (FPÖ, Austria). Chauprade was present at the WCF VIII in Moscow too and even sat in the presidium of the congress. Also present at the congress was FPÖ's Johann Gudenus. 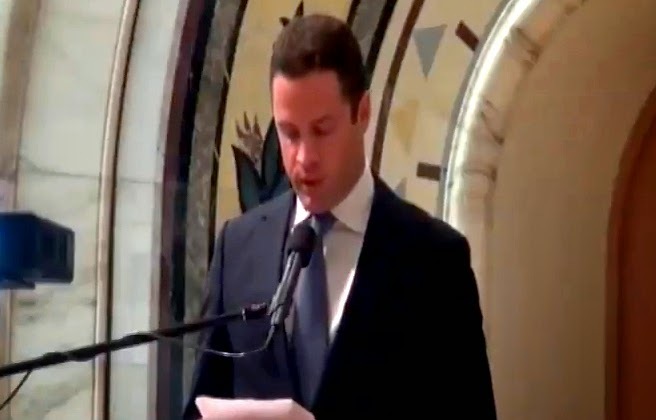 He condemned Western sanctions against Russia that is waging war on Ukraine and talked about "the strong gay lobby in Europe" that "controls the mass media". According to Gudenus, the US, obviously, is behind the alleged attempts at destroying the traditional values in Europe. Major Austrian political parties have criticised the message of Gudenus, and Federal spokesperson of the Austrian Green Party Eva Glawischnig urged the FPÖ's leader Heinz-Christian Strache to distance from Gudenus' speech at the congress: "The FPÖ chairman must decide whether he and his friends want to be in the pay of Moscow or on the European side". It looks, however, that Strache has already made a decision. 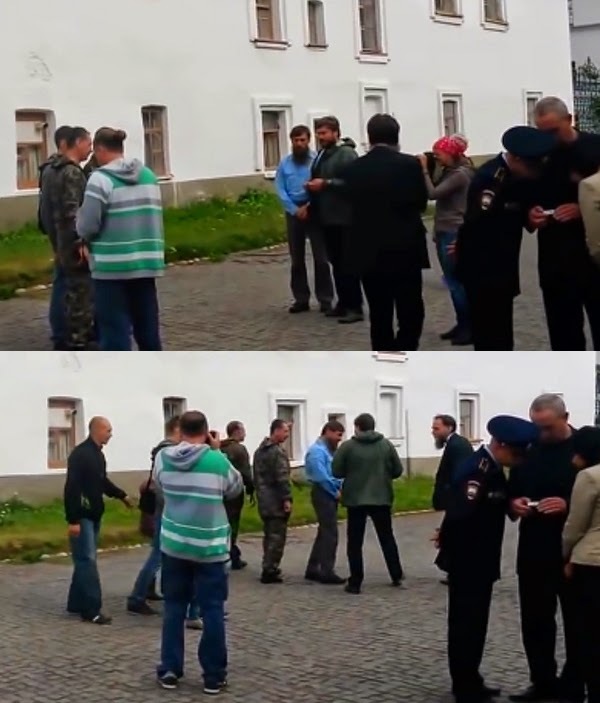 In March 2014, Chauprade and Gudenus were among the "observers" at the illegal "referendum" in Ukraine's Autonomous Republic of Crimea first occupied and then annexed by Russia. Like many other far right politicians, each of them has a history of cooperating with the Russian authorities. The congress was essentially a political event aimed at presenting (and reinforcing the image of) Russia as a bastion of family and traditional values. In the absence of progressive modernising tendencies, Russia needs to lay claim on at least some primitive idea to explain the presumable validity of its ambitions for global leadership. The information is good, but I have to sincerely disagree with some opinions. This seems a meeting of conservative groups, not of "hate groups" or extremists. The only "haters" maybe are the members of FN and FPO, but I think they didn't go as official representatives of their parties. In the meeting of Moscow there were representatives of main religions, including a cardinal from the Catholic Church and a Jewish representative. They are mainstream representatives of accepted religions, not members of extremist factions. HazteOir is a conservative group linked to liberal-conservative PP (the party on Government in Spain, Centre-Right). The leader of HazteOir is a nephew of Rodrigo Rato, ex-Minister in Spain and ex-Director of the International Monetary Fund. An ex-Minister of PP (Jaime Mayor Oreja) attended to past editions of WCF and usually works with HazteOir, which is a democratic organization and was fanatically pro-USA and anti-Russia until now. That is precisely the big problem: Putin is not only getting support from the radical right and neo-nazis. Now he is also getting support from respectable liberal-conservative groups which govern in Europe. Putin has managed to puport himself as a conservative leader concerned with family values and a defender of Occident. Or is it possible that Putin is opposed to the Fascist take over in the Ukraine as spurred on by a the USA. Far be it ever that the US would back right wing cabal to overthrow a democratically elected government that the US doesn't like. There was no "fascist take over" in Ukraine, don't talk BS. I agree with "refractario". Let's remember that the communist had the habit of calling fascist anybody not communist. Today even the democratic left sometimes does very much the same. I am myself a liberal-conservative. I understand this conference was directed subvert likely-minded people into supporting Russia. You do not have to be left-wing to fight that, on the contrary. He explains why Putin is gaining support from moderate catholics and conservatives in Europe. He also explains to these catholics why this support to Putin is a big mistake. It blows my mind that Religion still seems to think that can get away with their bigotry without anyone noticing. Perhaps this is why these conferences keep going to smaller less known countries (no offense to Georgia), it allows them to practice their bigotry on a less well known stage. So thank you for exposing their horrors.